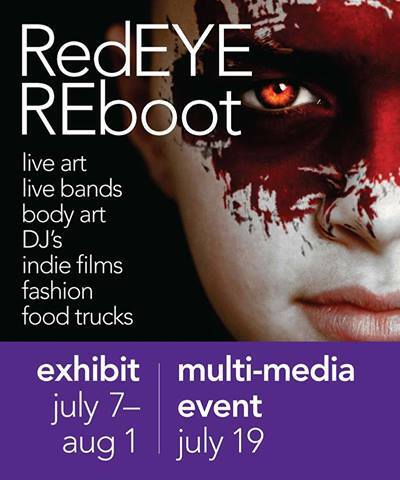 RedEYE is the hottest art and entertainment event of the summer. An underground art tour de force, RedEYE this year is “ReBOOTED” to feature street art, comic art, body art, urban inspired and cutting edge art and social commentary. 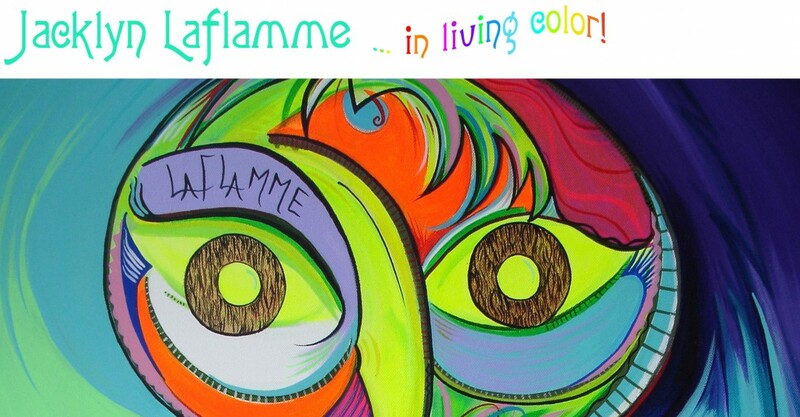 Visual art and performance pieces are complemented by live bands, digital art displays, interactive installations, fashion, food trucks, indie film shorts and wild fun. It’s the hottest art event of the summer. Don’t be left in the cold. 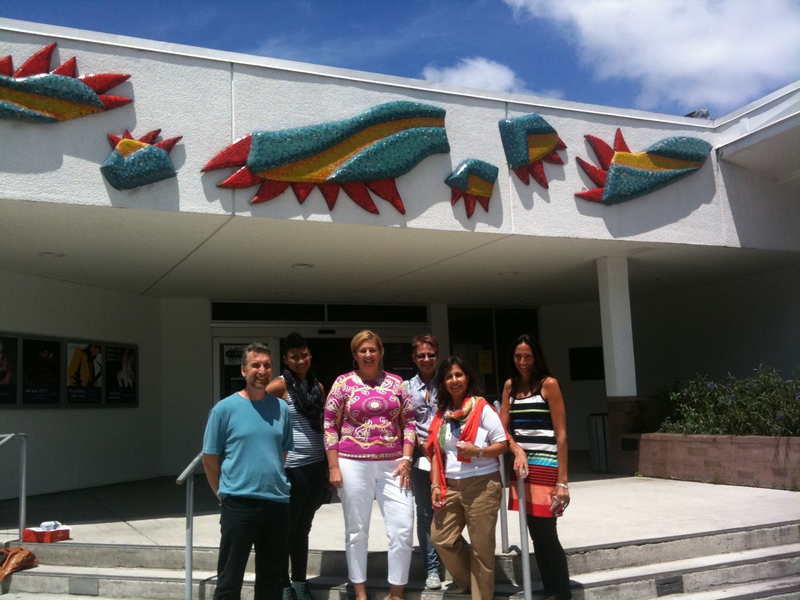 Categories: Art In Public Places, Events, Exhibitions, Murals, Paintings, Photography, Sculpture, Sketches | Tags: acrylic on canvas, art, art gallery, art in public places, Art Serve, artist, artists, arts, body art, body painting, broward county, canvas, cars, community projects, community renewal, culture, DJ's, exhibition, famous artists, fashion, fiat, film, Food Trucks, Fort Lauderdale Florida, images, indie films, live bands, networking, poerty, reboot, red eye, rick case, spray painting, street art, summer event, underground art, Visual arts | Permalink. Slow Art Day is a global event run by volunteers with a simple mission: Help more people to discover for themselves the joy of looking at and loving art. For one day every year, people all over the world visit local museums and galleries to look at art slowly. Participants look at five works of art for ten minutes each and then meet to over lunch to discuss the experience. In October 2009, the program launched in 16 museums and galleries across the United States, Canada and Europe. In the spring , it expanded to 55 locations spanning six continents, with nearly 2,000 participants. Currently there are 252 plus venues around the world that are now participating in Slow Art Day. We all have the power to stop and smell the roses, but with our busy lives and full schedules sometimes we forget to slow down and really appreciate the beauty that surrounds us. In this particular case for me personally it was a great experience. I admit that I am always on the run and have never taken the time to walk around the building and really appreciate the public art work at Art Serve. It made me think about what else I might be missing. We should all practice taking a break to relax, look around and celebrate the art and culture that is abundant in our communities. I would like to Thank all the volunteers that make this day possible! Categories: Art In Public Places, Events, Inspirational, Murals, Paintings | Tags: art history, Art Serve, arts, broward cultural division, communities, culture, deborah kerr, Galleries, jacklynl laflamme, micheal harris, municipalities, museums, painting, poetry, project, sculpture, slow art day, statues, United States, Visual arts, world event | Permalink. 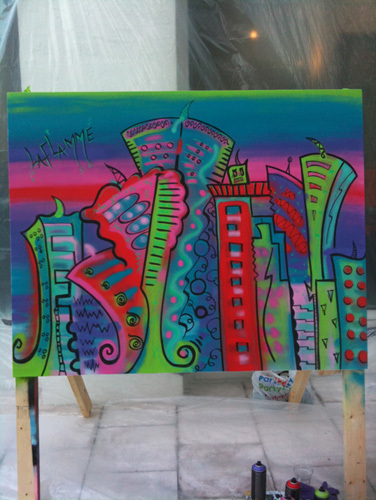 The Greater Fort Lauderdale Alliance worked with Art Serve and invited artists to paint live at the event Palette To Palate at Gallery ONE – A DoubleTree Suites by Hilton Hotel. I had a blast painting live, high heels and all! It is a form of improvisational performance art, in which artists complete a visual art piece in a public performance. 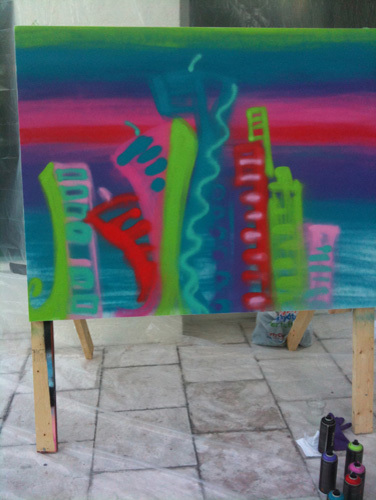 In this particular case I had two hours to complete a 4′ x 6′ canvas. Using spray paint and markers, I completed the task. It is a contrast to working in the studio and having the gift of time to create, detailed fine art. 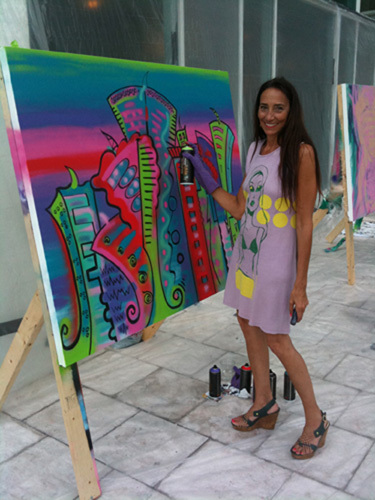 I would like to thank The Greater Fort Lauderdale Alliance and Art Serve for allowing me to create, paint and share my work, at their wonderful event! Categories: Art In Public Places, Events, Paintings | Tags: Aerosol paint, art, art gallery, art in public places, Art Serve, artist, broward county, community projects, Create, Directories, Fort Lauderdale Florida, Galleries, Grafitti, Greater Fort Lauderdale Alliance, jacklyn laflamme, Live, Markers, Paint, Palette, Performance, Shopping, sidewalk art, Spray Paint, street art, Visual arts | Permalink.